You have many typical products to buy in Israel, from antiques to cosmetics, to textiles and spices. This sovereign country in the Middle East is a melting pot of cultures, not just the home of millions of Jews. The state of Israel welcomes Arab Muslims, Christians, Jews, and numerous ethnic and religious groups. In the same way, its culture, gastronomy and typical products are varied and numerous. Therefore, if you still don't know what to buy in Israel, pay attention to the following list of souvenirs which you can take home with you. Israel is a country with a lot of history; for this reason, it is one of the perfect places to get antiques. From coins from Roman times to ceramics and all kinds of objects with centuries of history. Strolling through its streets you will find numerous antique shops with a variety of unique souvenirs to buy in Israel. This country treasures numerous relics, ancient jewels and religious objects from centuries ago. Objects of copper, stone, clay, bronze, gold, and silver form an authentic cultural treasure which is auctioned in large prestigious events. Of course, if you don't have enough of a budget to buy a unique jewel, there are high-quality replicas which are perfect to take home as a souvenir of your trip. Out of everything that you buy in Israel, textile products are the preferred souvenirs for many tourists. Of all the typical products of Israel, handkerchiefs are undoubtedly the star. Israeli handkerchiefs, also known as Palestinian handkerchiefs, are made of cotton, silk, linen or cashmere. Their variety of designs and colors will make you want to take more than one souvenir. One of the best things to do in Israel is to take a stroll through its many bazaars. In them, textiles are the star products, compare, choose and haggle the price. Surely you will find what to buy in Israel in one of these peculiar establishments. The cuisine of Israel is very tasty; this is mainly due to the use of spices in the kitchen. From the spicy to sweeter flavors like cinnamon, the spice stalls in the market are the perfect places to get one of the most coveted souvenirs of Israel. Kosher cuisine is one of the most aromatic and delicious you can taste, but not only that, the Arabic cuisine and its spiciness are also present in the dishes of this country. 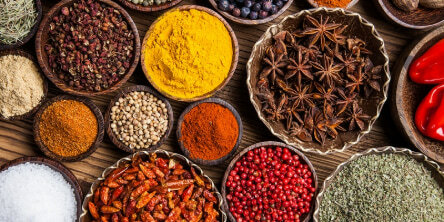 Spices such as chili, basil, oregano, parsley, sesame zaatar, sweet and spicy paprika, cumin, or turmeric are just some of the most used. Another of the gifts to buy in Israel and to count on when it comes to giving a gift are beauty products. The best-known are the properties of the Dead Sea mud, with which soaps of great cosmetic quality are made. These soaps are one of the souvenirs of Israel which are the most bought by tourists. You can get all kinds of products for body and facial treatment: creams, masks, massage oils, wraps, etc. The natural properties of these products are highly appreciated by the great personal care brands. Another of the typical products and souvenirs of Israel are the artisan objects. The Jewish people have been working precious metals for centuries: candlesticks, vessels, glasses, cutlery and decorative objects. But also bracelets, necklaces and all kinds of jewelry suitable for all budgets. What better souvenir to buy in Israel than a pendant with plant motifs or inspired by the Hebrew alphabet. The silver in combination with precious stones, or simply the meticulous and detailed work of the artisans, make each piece unique. Coffee is another of Israel's souvenirs which will delight your friends and family. The Arabic variety with cardamom is an authentic delight. Not only can you take it as a gift, but also to have a good coffee and remember your trip to this historic country. On the other hand, the varieties of black teas, especially hibiscus, are among the best you can find. If you are a tea lover, in Israel you will find mixtures from the area which will make you want to take home kilos and kilos of this precious liquid. Finally, don't forget to try their wines and their precious olive oil. Two typical products of Israel which, although they are not well known, well deserve a good tasting. Although Israel is a dry country, it produces a wine with a peculiar flavor that is highly appreciated by locals and visitors alike. Now that you know what to buy in Israel and what the most appreciated typical products are, don't forget to include a visit to the markets to get one of these souvenirs in your list of things to do.